The pics featured here were posted directly to the club as the original deviations are no longer available at the artists' DA page. Personal Quote: "Doooo-mo." also, "i hate gonta-kun"
See instructions for joining at left. More club information here. 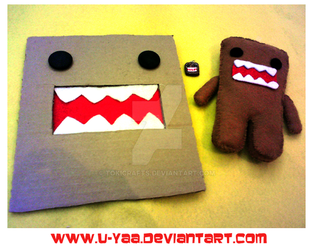 So, as some of you might recall, in my last journal entry, I stated that the club would be doing things a little differently from now on, and instead of adding pics to the club's gallery, any Domo-related pics would be added to the club's favourites, and then periodically I'd post some thumbnail sharing journal posts. Well, THREE MONTHS LATER ( ) here's the first installment of said thumb sharing posts! Pending you haven't already browsed through the club's favs, hopefully you'll see some new pics to or comment on! Domokun emote by club founder and super awesome artist, Blackmago!! Hi, I see you are watching my old account. I have a new one now: I hope to see you there, thanks for your support! We don't just want numbers, we want THUNDER! We've picked you for your creative RAWRsomeness. So please accept an invite to join our new group, SUPERshow2016.